Dreamer: Howzit. Ok got the pics on my machine. Just under 500megs. How do you wanna get them from me? Chanteuse: Hmm, will have to come with my camera and get on there … Ummm, Wednesday evening? Or you still on shift from 1pm – 9pm? 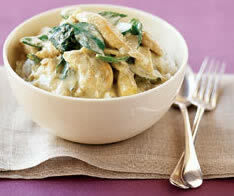 Amazing how any conversation with Dreamer can somehow come round to me making Thai Chicken Curry for him. It is his payment for EVERYTHING! If I need him to walk/swim to Australia and personally wrestle an alligator and extract it’s teeth to make a necklace for me, he’d say, “Ummm, if you make me a Thai Chicken Curry and I can take all the leftovers, okay!” hahaha. Pity I don’t look like a praying mantis (my loving term for those horribly stick thin girls that have no flesh on their bones) and learn how to keep my mouth shut, I’d be his perfect woman! HAHAHA! (Serves 6-8) Or 2 if you invite Dreamer! Okay, so start by marinading the chicken in cornflour and soy sauce, a little trick to ensure tender chicken when stir frying – just sprinkle cornflour over the chicken fairly generously and coat and then do the same with soy sauce, you should be left with a brownish marinade coating the chicken – allow to stand while you continue your prep work. Julienne your Ginger, chop chillies, slice spring onions, slice whatever veg you’re using from list above (it looks nice to cut on an angle). In a cup, put 1 tbsp soy sauce, 2 tbsp fish sauce, and 1tbsp sugar and mix, set aside. Heat your wok, add some vegetable or peanut oil, and add chicken in batches, don’t overcrowd the wok in one lot or you will have a stew on your hands and it will all stick together, once all the chicken is in the wok and translucent, add the ginger, spring onions and chili and stir fry for about a minute or 2 max. Add soy, fish sauce and sugar mix and stir fry for a further minute (Be warned, the fish sauce smells disgusting when you add it, but it is essential and the smell goes as soon as you add the coconut milk). Add Coconut Milk/Cream. Add remaining veggies and simmer until veggies cooked but still crunchy. Before serving, add torn basil leaves. No need to add salt, the soy sauce and fish sauce is all the seasoning you require.